Newer concrete park with 2 bowls. The Deep bowl is 8.5 feet deep. 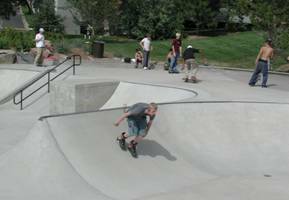 This is more of an intermediate skill park with good trannies and lots of banks, hips, and metal coping, and a 20 foot long runway so you can get some speed going.